We Supply Traffic Film Remover (T.F.R) in various sizes. This is a water based chemical and it is so versatile it can be used from cleaning factories to washing cars. 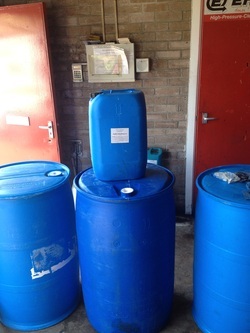 205 ltr (larger drum in pic) usually supplied to large industrial companies and garages. 25 ltr jacks popular with smaller companies e.g taxi drivers. 5 ltr jacks popular with general public for general garden cleaning e.g patios. Prices vary depending on size of chemical required. If you require any information on our chemical products please feel free to contact us. We also have a copy of the C.O.S.H. sheet for you to look at on this website, as we have to comply with all regulations.